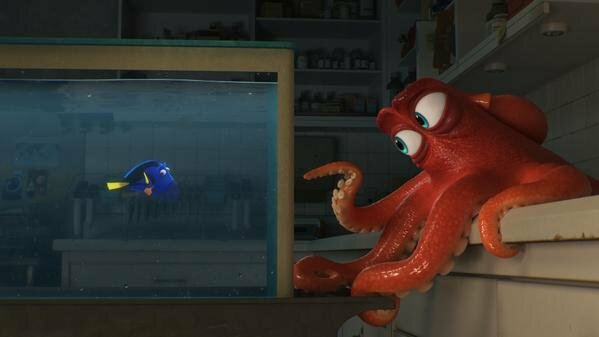 At the D23 expo this weekend, Disney revealed the first photo from the upcoming Finding Dory, along with announcing some new details on both the casting and plot of the much-anticipated sequel. The image, which can be glimpsed above, doesn’t tell us a whole lot, as it simply shows Hank the octopus (Modern Family’s Ed O’Neill) engaged in conversation with the titular fish, who doesn’t look to be in such good spirits. From what Disney revealed at D23, the scene takes place in an ocean sanctuary facility that Dory’s trying to escape from after ending up in there when she was separated from Marlin and Nemo on a journey to find out where she’s from. While in the facility, she’ll also meet Ty Burrell’s Bailey, a white beluga whale, and Kaitlin Olson’s Destiny, a whale shark. Finding Dory will swim into theatres on June 17th, 2016.